Pat Uhart was born in Denver, CO and has resided in San Diego County since the early 50's. Always enjoying math and having great attention for detail, Pat went into the Tax Preparation and Financial business and has been self-employed for most of the 39 years in this business. In 2005, wanting to explore something more for relaxation, she started in Watercolor classes at Foothills Adult School, El Cajon, CA. Despite her initial inability to draw and paint more than "Stick Figures" and "Lollipop Trees" she remained enrolled in these classes and continued learning semester after semester and remains in attendance today. Pat attributes much of her current painting ability to her classmates who have always encouraged and assisted her and other new students since the very beginning. Pat was eventually introduced by several classmates to the San Diego Watercolor Society located at Liberty Station, Point Loma, CA and began showing her work there in June of 2008 after becoming a member. She has been accepted into many shows and won awards at the Watercolor Society’s monthly shows and other galleries such as Main Street 5 Gallery, El Cajon, CA and Foothills Art Association, La Mesa, CA. 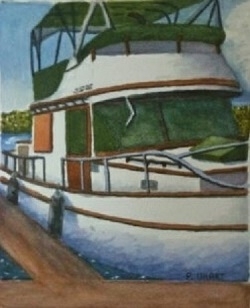 Pat is currently on the Board of Directors for San Diego Watercolor Society in the position of Treasurer. Her involvement in the Watercolor Society and painting has given her the much sought after escape and relaxation needed from the highly technical and numerical world of her business. The monthly “En Plein Air” paint out sessions, which include demo artists from around southern California, have been a great way for Pat to get out in the fresh air, away from her desk, and to take the time to learn something fun. I hope you enjoy Pat’s paintings as much as she enjoys painting them. She looks forward to expanding her horizons and painting more in her life. 04/19/2019 07:56:57 Copyright © 2014-2019 Watercolors by Pat Uhart. All rights reserved.